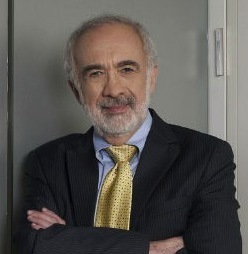 After stealing the show at drupa 2012, Benny Landa didn't bring his nanographic printing technology to Graph Expo. But he was there in person, meeting with Landa customers, along with several additional members of his team; including Mimi Sela, Corporate Vice President of Strategy and Investments, and CEO of Landa Ventures. We had a wide-ranging discussion that started with an explanation of some of the other projects Landa is working on. Landa Corporation has four operating units: Landa Digital Printing, Landa Labs, Landa Ventures and Landa Fund. It is the first two I will be focusing on in this article. While I am sure there are a number of energy-related projects going on in Landa Labs, we spoke specifically about using nano technology in the thermal energy realm. As Landa explained it, consider water that is heated in an electric kettle. It took energy to raise the temperature of that water, and there should be some way to reverse the process – to convert the heat back into electric current as the water cools. For example, could the waste heat from power plants or automobile engines be used to generate light or provide power to other devices? This is, of course, an oversimplification of what Landa Labs is up to. But what we are talking about here is the generation, use, conversion and exchange of thermal energy between systems. While I'm certainly not qualified to comment on what the outcome of this may be, as a very energy-conscious world citizen, I am interested in following their progress as it evolves, and I salute Landa and his team for investing significant resources into this research and development. It appears that nothing will be commercially available for four to five years, but we certainly hope we will hear about progress along the way! Landa Labs is also working on ways that nano technology can be used in drug delivery systems. Many medications are water soluble and can be delivered intravenously for rapid absorption. But what about those that aren't? Can they be manufactured in tiny enough particles that they can either be suspended in an IV solution for delivery or introduced into the body in some other way? This is another exciting use of nano technology Landa Labs is investigating, and commercial availability is likely to be several years away. This is also very important work about which Mr. Landa is quite passionate. And now for the part you have been waiting for…nanography as shown at drupa. According to Mr. Landa, the company continues to make progress against very specific goals and objectives that must be met before the product is market ready, and is also continuing to work with announced partners as well as developing additional partnerships around the world. Quality, of course, is one of those key objectives, and the ultimate aim is to reach offset quality. 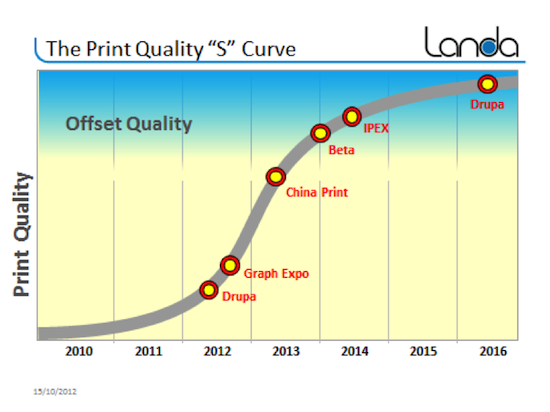 The chart below reflects progress that has been made since drupa on Landa's Print Quality S-Curve. Please note that the shows cited are merely markers in time rather than a statement that the technology will, or will not, be at a specific show. As you can see, by Ipex 2014, scheduled for March 26th through April 2nd in London, Landa expects the presses to be well inside the offset quality zone, and by drupa 2016, to be in the high end of the offset quality range. Beta placements are targeted for the end of 2013 and early 2014, and beta sites will be selected from among the many letters of intent signed during drupa. Landa indicated that he is often asked why he isn't marketing more. In a very logical answer, he pointed out that with the number of letters of intent that were signed at drupa (the exact number hasn't been disclosed but it is in the hundreds*), the focus shifted from marketing to engineering and production-there is already a pretty robust customer base out there and it is more important to get product to those folks than to expend a lot of resources drumming up more interest. During our meeting, Mr. Landa shared print samples on a number of different substrates that showed drupa quality versus what the process is achieving today. (I tried to scam a few, but he was very alert and I failed!). The improvement is clearly visible. One of the key issues the team is working to resolve is a fine white line that appears at the inkjet head seams; that is, with multiple inkjet heads across the width of the substrate, where they are "stitched" together is leaving a noticeable, though very small, gap. The labs are hard at work on this issue and a number of different solutions are being investigated. As you can see from the steep post-Graph Expo incline on the S-Curve chart, the team is pretty optimistic that significant progress will be made over the next few months. We'll be staying in touch with Landa as 2013 unfolds to see how they are doing against these aggressive goals. We will also be interested in following the beta process depending on the level of transparency the company and its customers are willing to offer. One question I had for Mr. Landa was why he would want to manufacture, sell and support his own presses rather than focusing only on providing the (likely) more profitable consumables. His response? "We want to control our destiny. We are very pleased with the partnerships that have been established, but we also feel that we may be able to move at a different rate of speed than our partners as we bring this technology to market, and we need to be able to meet the clear and present customer demand." *A recent article states that the number of orders in the queue is 400. This number has not been confirmed by anyone from Landa Corporation. How were the data points calculated for the S curve? What is the unit of measurement of "quality"? I would have to defer to Mr. Landa on this question, Henry. I have notified him that the question is pending. When developing new science or technology such "S" curves are not necessarily what will happen but what is hoped will happen. The development process if full of finding and solving known and unknown problems. In such a situation, there is no guarantee of success. Unlimited amounts of money and brains are sometimes not enough. Best of luck to the Landa development group and I hope they are able to overcome whatever problems they need to solve. Actually I extend that hope to any group that does development work. Developing innovative concepts is critical to the health of the industry. Landa is not competing with traditional offset; he is competing with all other enticing things known for a very fast print replacement. Digital devices are developing at much higher speed. They also change marketing as we know it. For many years marketing was about visibility but in the new media world it is a two-way street. You have to compete and protect your reputation in a real time. In the future almost everything is going to be a short run. If it will take Landa few more years “to catch up with offset” he may miss larger opportunity. The problem with print today is a barrier created by traditional print manufacturers. Most of them dedicated all of their resources to a development of large presses with complicated and unpredictable support infrastructure. As a result of it the number one thing most people want from a traditional printer is to go to that printer less often or not at all. Landa catching up with offset is like a fast car catching up with a wagon with a cool re-introduction of wooden wheels. There are many portals today, and they will grow at iPhone speed, enabling business to design, develop and customize their own promotional materials. The only reason why they go to companies like Vistaprint is the cost of toner or ink jet consumables. In our instant world any employee in any company can create promotional material in few hours and have it proofed and approved in few minutes but when everything is ready to go on the internet and on monitors printing alone has to wait and has to be delivered by a snail mail. This is an excellent opportunity for a manufacturer who will develop a device which will replace today’s copiers and ink jets.. Print will have to move away from traditional printers in order to survive. If it takes Vistaprint 7-14 days to print and mail back trifold any business would appreciate a device on their own floor which would be able to print 5000 pieces in one day at reasonable cost and good enough quality. You have to ask: What will be actually printed on Landa devices in 2016? It is disappointing to read that Landa’s plan, after “offset quality is achieved”, is to develop own presses and build own distribution and service in addition to “Landa enabled conventional presses”. This just shows only few get the urgency and majority will continue “focusing” on heavy iron missing the digital boat and pushing print out of the new media world. Nanotechnology will eventually offer inexpensive solutions and it will enable print to survive after somebody else will destroy those silly barriers from the offset past. Printing technology will survives only due to the highest possible quality. And I think Landa has found the very true way to compare his nanographic printing with offset. And what will be after 2016 and after,...who can predict exactly????? Though print quality is comprised of numerous factors, some of which, such as optical density and color gamut, can be numerically quantified, in the final analysis overall print quality is a subjective measure. Landa employs similar methods to others in measuring overall print quality: grading by human observers. Therefore the vertical axis on the S Curve is a qualitative representation, not numerically quantified. What I am happy to hear is that after all this time and money spent with the advancement of digital printing, the level of quality is still being compared to offset. Since I am interested in the development of advanced offset technologies, it tells me that there is still a competitive race for that short run production range. It has been reported that Landa will try to raise $ 1bn to develop his process. For less than 1% of that figure, the press manufacturers could develop the technology and methods to take that ultra short run range market away from Landa and other non variable digital printing processes. The science has been done and the costs are relatively low. Now that would make an interesting horse race. PIRA and PIA predict all print grow through 2016 ~ 1 or 2% yet, each study also predicts Digital will grow between rates of 4 and 8%. One does not need to be a Wharton or Stanford Graduate to figure out where the markets are and will be. The real opportunity is in forecasting when the growth curve hits the upward shape of the proverbial hickey stick. This requires more than promise. One way to speed up market acceptance levels for greater digital adaption is to improve all digital color print output and Benny knows it. The unstated "market" objection is IMHO that digital does not quite match or exceed client demands in print expectations for quality. Until this is solved we are watch inexorable change. When it happens we will see rapid changes for digital presses to Printers and or to the SOHO markets --- each being totally different markets on needs, costs and in their general expectations. Digital is growing and so the smart money sees and is working toward this real change need. The opportunity is to be first in quality while also fitting into market expectations on prices that make sense. The market speaks for low cost, maximum flexibility AND quality improvement for many reasons. The higher res from CTP and offset, needs to be matched. Affordably. All puzzles are solved but at what time and cost? The trends are clear present and so the wise will watch for the RIP Res levels and digital unit sales costs to match then be the first to forecast when the max growth curves will appear. Offset Quality is a goal to shoot for, but the typsetting industry was transformed before it reached the high resolution it is today. When it first came out people scoffed at it and said "This will never replace hot type! Look at the jaggies!" There is a market for this technology now and as it grows it will only get better. Landa should utilize the dollars now that could fund the refining of the process... and offer early adopters an cost effective ungrade path that allows them to take risks by investing early. It's a win/win for both sides. KC it sounds as if we agree. The shift is about customer quality expectations and fit to market costs. The rest will follow. Stan I do not think Landa is competing with any other than his own vision. Innovation never rests as it is always needed and most rewarding. He who gets there first wins. Thank you for your posts, Greg. I am not sure what is growing or what will grow in the printing industry as we know it today. Competitor to digital printing is not a traditional offset but “retina quality” display flooding global markets as we speak. I would challenge any predictions with today’s reality. What is being predicted for the future may be in the past already. Medical insurances, for example, require all doctors to submit claims in a digital form only. If doctor still insists on sending paper forms only, some insurance will require written request and permission will be given for 6 months only! This single move impacts not only form printing but also promotional printing from insurance to doctors. Why? Insurance posts all materials on the web sites for doctors to get it. Doctor may decide to actually print it and give it to staff or patients but he/she will not do it for many reasons. While this is happening in many other fields we talk about Anicolor and printing equipment developed for printers who are used to print for insurances (for example). Cary asked a very good question; ”Why Landa would want to manufacture, sell and support his own presses rather than focusing only on providing the (likely) more profitable consumables?” Answer to this question puzzles me. What was on display at drupa 2012 was not equipment for 2016. It was a display for 2012 only. For print to survive much more has to be done. Now we read about technical issues and less marketing. While it was stated that all partnerships are happy partnerships the only one who talks about a need for change is Benny Landa! It is rather disappointing to see a complete absence of traditional press manufacturers and if this will continue, we may as well wait for Apple or somebody else to take the opportunity and develop it into actual products. Printing industry talked about short run for at least last 15 years. Short run is now standard. Unless you are in packaging you have to address short run in your production. In 2016 “ultrashort” run with personalization will represent a significant opportunity for companies like Landa but I do not see this major shift having any impact on the product development from Landa or his silent partners. Should we worry about offset quality now or should we worry about the printing as we know it today? Erik, with all due respect, you read the article wrong. Mr. Landa is not seeking $1 billion in funding; that was the valuation of the company. He is seeking $150-200 million according to the article you cited. If it were so easy for offset to accomplish what nanography promises, why are Heidelberg, Komori and manroland all over this in partnering with Mr. Landa? I wouldn't underestimate what Mr. Landa will be able to achieve in the marketplace, with or without his offset partners. Cary, the $150-200 million he was trying to raise was only from the banks in the UK on his recent visit there. He has already raised a lot of funds from the deposits. The article stated that the total was about $1bn. You say the $1bn is the valuation of the company. OK. What is his company going to do with that new $1bn? I think they are going to try to develop a printing technology. Are they going to use that money to develop his energy projects? I don't think so just yet since that might not make people happy to think they put their money to support printing technology and it goes somewhere else. Why are not Heidelberg, Komori and manroland trying to accomplish what Landa is aiming at. I don't know. You are the journalist, you should find out and let us know why. All I know is that it is possible. Just because groups have not done certain things does not mean that things are impossible to do. Innovation is always a surprise. I have nothing against Landa and his process. I wish them luck but I also know they have a lot of issues to solve. I am not anti Landa but pro offset. Don't underestimate the potential of offset. Erik, the energy and medical initiatives, to my understanding, are completely separate. I wrote about them only because I was interested. There is certainly no question you are pro-offset. Personally, I am not pro-anything, I am in favor of using the appropriate technology for the job. Has Landa performed or published an analysis of the downstream issues of product produced with this process, particularly post consumer recycling? My curiosity is based on the end product appearing to be a bonded polymeric film laminated to the carrying substrate. I'm not an expert on any of this, but I've certainly been watching Landa as closely as possible, starting pre-drupa, attending the wonderful show at Drupa, and seeing Benny's talk at the breakfast at GraphExpo. A couple of little comments. First, the $1B is the revenue that would come from press sales based on the orders for which the company has received deposits already. That is what Benny said at GraphExpo. And he gave this as the primary reason they weren't exhibiting at the show-- they now need to focus all of their people on building the machines to fulfill those orders. As for the question by Mark, which is an interesting one-- hopefully one of my TAGA (www.taga.org) colleagues will answer that at some point in the near future, we have some leading experts on such issues. From what little I do know about those things, primarily from listening to academic talks on the subject of Ingede (http://www.ingede.de/ingindxe/methods/meth-e.html) at TAGA, it would appear that Landa will be recycling friendly. I've actually seen the ink scraped off the substrate (i.e., paper) with a door key. Obviously, that's not the whole story, but I think it bodes well.